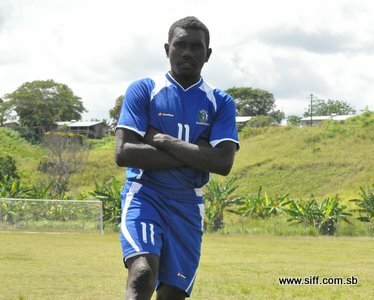 Bitiai comes from the Shortland Islands in the Western Province and if there is one thing that area is known for it has little to do with producing football players. That region is famous for producing some of the top boxing stars in Solomon Islands. However, standing 1.76m tall with a build to match at just 16, Bitiai is certainly determined to cement his mark as the first Shortland Islander to represent the country in a FIFA World Cup qualifying competition and hopes that many more from his home region will follow his lead. His style of play is simple and he is already winning a lot of attention for his strength, ability to shoot with both his left and his right and the directness of his playing style. Already having made his mark in the TVL International Tournament with the SIFF LEARN&play team in January in Vanuatu where he scored the first goal of their tour from a long range effort just seconds into their opening match Bitiai brings with him to the U-17 team the strength and determination that will be vital for the squad against their highly rated opponents. Head coach of the Katukatus, Chris Asipara, has heaped a lot of praise on the forward since he joined the team in late November. “Bitiai performed well with the LEARN&play team in January but this time he has shown more power and more intelligence. I am especially happy that he has naturally linked up with the other forwards in the team,” Asipara says of Bitiai. The following is an except from an interview conducted with Bitiai. I started playing as kid in my village where I recall that it was difficult to form a team for a football match so the few interested ones will just get together for a kick around. When I was selected for the LEARN&play program I was able to follow my interest in football and undergo full-time training. What are your goals as a football player? I aim to represent Solomon Islands at the senior level. Who is your favourite player in the national team? James Naka is a player which I admire for his skills and ability to perform both in the 11-a-side code and in beach soccer. He is a very intelligent player who can score goals and set them up for his team mates as well. What are your aims for the U-17 championship? My aim is simply to help my team qualify for the World Cup. It is a big challenge for us but I know that all of us are determined to do our best for our team. If we win it will be a dream come true for me. When you don’t play football what do you play? Boxing. Why? Boxing is very popular in the Shortland Islands where I come from so I think it is a natural second choice. I have spent some time training as a youth boxer but my family has not allowed me to take part in any championships yet. How do you feel to be playing football coming from a region where boxing is more popular? Growing up everything around me was about boxing. Some of my relatives including Joseph Saimei, Albert Binoa and also John Bitiai whom I am named after are well known names in boxing in Solomon Islands and have won medals in overseas competitions. In most villages in Solomon Islands people would be running to a soccer field in the afternoons but where I come from people would be looking for a punching bag so it was a big choice to play football in the midst of a strong boxing influence. You will have more young people at the boxing clubs than at the football field so there will not be enough players to form a team. My observations now are that things are a little different. After I joined the LEARN&play program youth in my village are starting to take an interest in football and I have noticed that more will turn up at the soccer field. The fact that I represented the Solomon Islands in the U16 team has also raised the profile of football in the Shortland Islands.